Thousands of IT professionals and developers flocked to Oktane19 to increase their knowledge base around security, identity, and business transformation in a digital world. To cement a recently announced partnership with Okta, Highfive’s video conferencing Premium solution was fully on display in the Oktane19 exposition hall. Over the three-day event at San Francisco’s Moscone Center, Highfive showcased its video conferencing solution to hundreds of Okta customers, partners, and IT professionals. Enticed to the booth via a Highfive-AMC movie ticket, many Oktane19 attendees marveled at Highfive’s hi-fi audio capabilities and HD quality video powered by Dolby Voice®. After exploring many of Highfive’s easy-to-use, dynamic features, Okta customers were elated to discover Highfive’s special offer for them. Highfive is empowering all Okta customers with FREE (yes, FREE!) desktop and web video conferencing services for an entire year. Every Okta customer can have their entire organization whitelisted in Highfive, so they can experience the market’s easiest-to-use and most delightful video conferencing solution. With no restrictions on meeting lengths or recording storage, Okta customers will have access to Highfive’s robust suite of applications and services. In addition, this partnership enables IT administrators to provision and manage Highfive users with Okta’s best-in-class enterprise identity management platform. With Okta, Highfive system management is now even easier. Highfive CRO Richard Borenstein and Oktane19 attendee delight in the ease of using Highfive’s Premium in-room video conferencing solution. The ability to seamlessly shift the hosting of a meeting to a variety of devices without sacrificing video and/or audio quality was an absolute crowd pleaser. Another attendee described an office devoid of video collaboration due to his “super non-technical boss.” Complaining that “our current setup requires my boss to know how to log into the computer hooked up to the TV.” They emerged from the Highfive booth after experiencing the sheer simplicity of Highfive’s one-tap-to-join meeting functionality. IT managers and administrators from a variety of industries were astounded by the ease of Highfive’s setup. 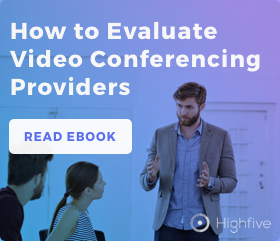 Setting up a world-class video conferencing experience by connecting three pieces of hardware with just a few cords was an extremely powerful demonstration of Highfive’s intuitive design and user-friendly experience. Other IT professionals were delighted by the prospect of no longer having to physically manage hardware and firmware upgrades. Running on fully integrated software, Highfive’s hardware is automatically updated every two weeks, liberating IT from hours of tedious labor. Highfive’s presence at Oktane19 and ongoing partnership with Okta should accelerate enterprises toward a simple and seamless video conferencing solution. Highfive will act as the high-octane fuel for the future of video collaboration.